The Bureau of Prisons has issued a record of decision signaling that it is moving ahead with plans to build a federal prison on the site of a former strip mine in the hills of Letcher County, Kentucky. But local opponents of the prison say they’re not giving up and are considering a legal challenge to prevent the construction of a new prison. Emily Posner, a civil rights and environmental attorney who’s been working with local and national organizations opposed to the prison, is part of a team of lawyers reviewing the newly issued decision. The United States Penitentiary, Big Sandy, near Inez, Kentucky. Congressman Hal Rogers, who serves on the powerful House Appropriations Committee, is the prison’s leading proponent. His Fifth District is a mountainous area spanning the eastern part of the state, and an area where immense amounts of coal have been mined. Today, it has an unemployment rate more than double the national and statewide averages. Rep. Rogers hopes prisons will bring jobs to the area. This would be the fourth federal prison to be built in his district. Rogers told television station EKB the process is moving forward because of his advocacy for the project. He said he learned of the decision in a call from Attorney General Jeff Sessions, whom he’d just met with the week before to encourage action on the matter. Posner, the lawyer working with groups opposed to the prison, takes issue with that description of the prison’s impact. She cites a body of social science research that indicates prisons built in struggling rural communities and prisons in central Appalachia have tended to have a negative overall impact on local economies. 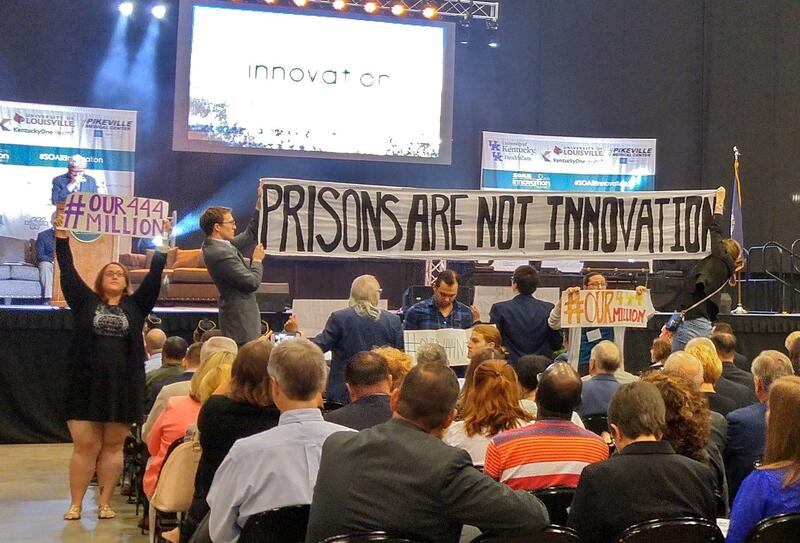 Tarence Ray holds up the left side of a banner protesting plans to build a new prison. Rogers and other supporters of the effort to build the prison say it’s needed to reduce overcrowding in the federal prison system. For the most part, there does seem to be consensus that U.S. prisons are overcrowded, but there is not widespread agreement that another maximum security prison is needed, or that building one in eastern Kentucky is the best option. In testimony last June before a congressional panel including Rogers, Deputy Attorney General Rod Rosenstein explained that his agency did not see the need for a new prison. The Trump administration’s 2018 budget removed funding for prison construction and proposed returning the $444 million that had already been allocated. Emily Posner said the inconsistency between the explanation in the decision and the testimony from Rosenstein makes her doubt the truthfulness and transparency of the process. “I’ve never seen this where the agency out of the one side of its mouth is saying we need this and out of the other side is saying we don’t,” Posner remarked. Meanwhile, preparations are underway in Letcher County. The idea of building a prison was first proposed in 2005, but had been stalled by an unusually lengthy environmental review process. The record of decision clears the way for the Bureau of Prisons to start spending from the nearly $500 million dollars allocated by Congress. Next steps would include purchasing land and readying it for construction. Local officials say they’re beginning to work on proposals to fund infrastructure improvements that would be needed, including upgrades to water treatment facilities.